To be clear, we never intended to become a Salesforce for nonprofits app developer. 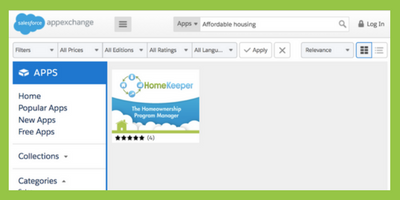 HomeKeeper is the only Affordable Housing and Housing Counseling app in the Salesforce AppExchange. It’s a program of Grounded Solutions Network, a national nonprofit membership organization that brings together an extensive network of partners and member practitioners from local communities, including community land trusts, shared equity housing program, and local housing agencies. We cultivate communities - equitable, inclusive and rich in opportunity, by advancing affordable housing solutions that last for generations. Early on, we realized our sector needed a new technology solutions to improve program management and aggregate sector-wide impact data for affordable homeownership programs. Unfortunately, unlike the common saying, there was no app for that. So we took a path less followed and set out to develop a solution on the powerful Salesforce platform. Before we knew it, we were app builders, managing our development team and product roadmap, recruiting and onboarding new users and providing ongoing user training and support. If you manage a community land trust program, a Habitat for Humanity affiliate, or other permanently affordable housing program, there’s now an app for that! HomeKeeper is in use by over 70 organizations and is the only app for homeownership and housing counseling programs in the Salesforce Appexchange, the marketplace for apps built on the Salesforce platform. HomeKeeper standardizes the way affordable housing programs track data throughout the full homeowner or housing counseling lifecycle, from intake and eligibility to purchase, post-purchase and resale. It helps program staff better measure outcomes and implement effective program practices. HomeKeeper follows the day to day workflow of staff, so data can be entered as they go about their day, not as an end of the quarter as a funder reporting exercise. Recently, we expanded our feature set beyond homeownership program management to include long requested features to help staff manage housing counseling activities, an adjacent and overlapping sector. With the help of our developers SoPact, DaizyLogik, and a dedicated group of eight HomeKeeper organizations, our HomeKeeper team added case management features. 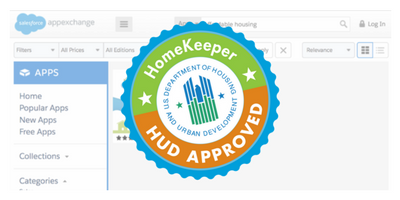 In December of 2016, we became athe first U.S. Department of Housing and Urban Development (HUD)-approved Client Management System (CMS) built on the Salesforce platform. This was one of our more complex integration solution built to date. So why did we become an app builder - Salesforce for Nonprofits? Front-line program staff are busy. Their workload includes spending a lot of time with paper files or in aging legacy systems that are inflexible,and time-consuming. They need better tools to do their job. Frequently too many data silos prevent real cross-program collaboration within organizations. Organizations needed a centralized platform to manage multiple programs and services. Prior to HomeKeeper, our sector only had expensive once-in-a-decade research reports that are limited in scope and not easily replicable. The affordable housing sector (and maybe your sector too) needed improved systems for real-time reporting and impact measurement. In the early days, what we heard from the field was, “Do not create yet another annual survey or a build a hub we have to log into to submit our data. It might make your jobs easier, but will be time consuming for us to complete, and you won’t get accurate or complete data.” Given that we weren’t a funder or government program with ongoing compliance requirements, we couldn’t require folks to share data with us. And if without their data, we couldn’t report on our impact as a sector. 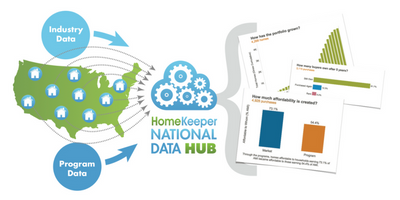 So instead, we set out to make their jobs easier with HomeKeeper, and make sharing effortless with our HomeKeeper National Data Hub. . Now, organizations are paying us an annual fee to support our HomeKeeper program , and sharing program data.. In return, they receive access to an online benchmarked Social Impact Report dashboard, so they can compare their outcomes to their peers.